Carling Knott sits at the north-eastern end of one of the ridges that run off Blake Fell, and looms over the southern shore of Loweswater, from where the ridge behind is hidden and the Knott appears to be an entirely separate fell. 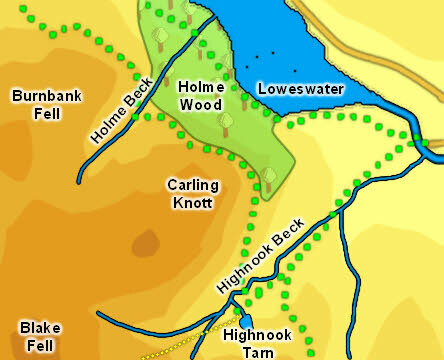 Carling Knott can be climbed from the west or the north - from the west along the ridge from Blake Fell and from the north up the slopes from the valley of Holme Beck. The south and east faces are rather too steep for walkers - the south-east face is especially steep and rough. I've made ut up the north-eastern face, overlooking Loweswater, but I wouldn't recommend it! The top of Carling Knott is a flat grassy pasture, topped with a small cairn. Holme Beck runs along the north-western flank of the fell, while Highnook Beck forms the south-eastern boundary. The fell also has a footing on Dub Beck, between the end of Loweswater and the junction with High Nook Beck. The southern boundary is formed by a nameless beck that runs down the valley between Blake Fell and Carling Knott. Carling Knott overlooks the very attractive High Nook Tarn, although technically that tarn belongs entirely to Gavel Fell. The fell also has a very attractive footing on the south shore of Loweswater. An excellent terrace track runs along the slopes of Carling Knott, at the top of Holme Wood. This track, which resembles a mine road or other track, runs all the way along the steep slope overlooking Loweswater but its origin and history is unclear. It is sometimes called a corpse road, but this appears not to have been the case. Perhaps more likely is a connection to the quarries on Burnbank Fell. The southern end of Holme Wood (on the north-eastern slope of the fell) has been planted with a variety of trees and at the right time of year the different leaves form the shape of the head of a pheasant.